Pushing Hand is that both persons cross the opponent's forearms and coil each other. It applies the unique exercises method of operating force like winding silk and the principle of sticking continuously, and flexible extension. It applies the eight methods of support, stroke, squeeze, press, pick, twist and elbow to practice respectively the skin feeling of the whole body and susceptibility of feeling of the inner body and techniques of bringing the force inside and dropping it so as to borrow force and control the heavy by the light. It has command well the strategies of responding promptly if movement is quick, responding slowly if movement is slow, keeping still when the opponent doesn't move; and moving before the opponent moves slightly, in order to affect the center of the opponent's body weight. At the most appropriate opportunity of time and force point , attack the light by the heavy and exert force outside by defeating empty by the solid. 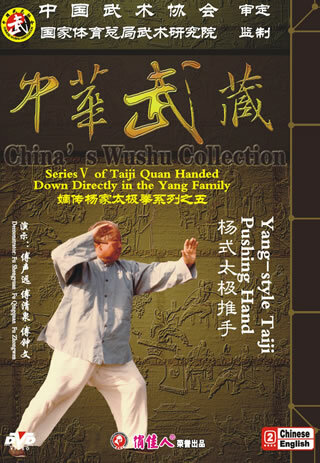 This kind of artistic sports trains not only strength and toleration but also physical quality such as smartness, techniques and speed, so it has become a kind of Wushu sports which everybody including men and women at any age can practice.